A biopic about one of the greatest American comedy duos of the 20th century is long overdue. In all, the comedy duo released 106 films between 1921 and 1951. “Stan & Ollie” is the vehicle to tell their story—not of their epic rise to popularity, but regarding the demise and reconciliation of the duo. Both were veteran Vaudevillains, but Stan Laurel, played by Steve Coogan, was the detail person, the idea guy, and the storyteller, passionate and devoted to the craft of comedy. While Oliver Hardy, played by John C. Reilly, was more undisciplined, frivolous, and there for the party—often distracted by women and horses, the vices that often led Hardy to marital troubles and financial woes. You get enough of the back story on them to grasp the dynamic of the duo and to pick up the pieces 15 years later, where the story resumes with their last tour of stage shows. This rekindles old feelings of animosity and warmth on a less than glamorous theatrical venture baited with the prospect of a new movie venture at its end. This last tour is a set up for heartaches and laughs. 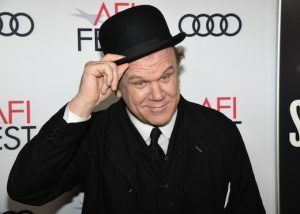 John C. Reilly at the screening of Stan & Ollie” at the AFI FEST Presented by Audi at the Egyptian Theatre Hollywood, December 14, 2018. “Stan & Ollie” kicks off colorfully enough with Laurel and Hardy strolling through the Hal Roach studio’s lot en route to set with a host of nostalgic visual references to the golden age of cinema. As they make their way to the set, there’s an off-handed greeting to the legendary talent of the times. Their stroll includes the obvious visual references to a troop of dancing girls, performers, and props being wheeled around which creates that buzz of early 20th-century film making. “Stan & Ollie” establishes the relationship of the duo with a sense of comradery and the conflict that arises from two people that live very different ethos, yet share similar aesthetics. Eventually, the differences separate them for over a decade and that shared aesthetic, and the prospect of a little financial “pat on the bottom” leads to their reunion for one last tour with the hope of another movie in the works. The remaining narrative arc circles around their classic routines, their struggle to be relevant in the age of Television, and their history together and reconciliation. The classic Laurel and Hardy routines and the sight gags are elemental to telling the Stan & Ollie story. They are seamlessly and abundantly weaved into “Stan & Ollie,” adding the necessary pathos and wit the duo was known for, making a much more compelling account of their story. Their stage shows start in small poorly attended venues and, finally, they find their “Theater legs” under the masterly planning of Laurel’s leadership toward their triumphant return to London. You feel you get to know them by the time they reach London and you find yourself rooting for them as if they had never split up. Once in London, things begin to unravel and the old conflicts that have simmered for years reappear and a showdown erupts. Yet, in these dark moments of “Stan & Ollie,” there is humor. This is where this movie really succeeds. 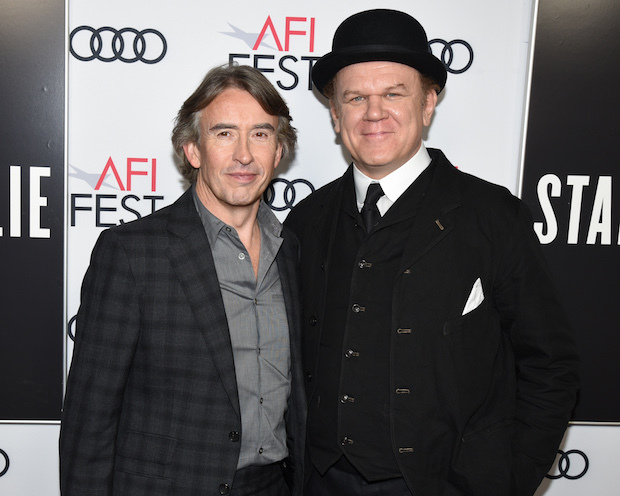 Both Coogan and Reilly really connect on a deep emotional level with the human condition that brings these characters to life. You love them and you can’t bear to see them bitterly part ways. By the time this squabble between the two ends, you’ve been both warmed and become a bit misty-eyed. “Stan & Ollie” is a homage to two grand figures in comedy film making and the movie brilliantly resurrects the genre in this wonderful retelling of their lives and career as comedy and pioneers and geniuses. This entry was posted in Movies and tagged 29th Century Comedy, AFI FEST, AFI FEST by Audi, Billy Bennight, biopic, Comedy, Comedy Duo, John C. Reilly, Movie Festival, Movie Review. Audi, Stan & Ollie, Steve Coogan, Vaudevillains. Bookmark the permalink.